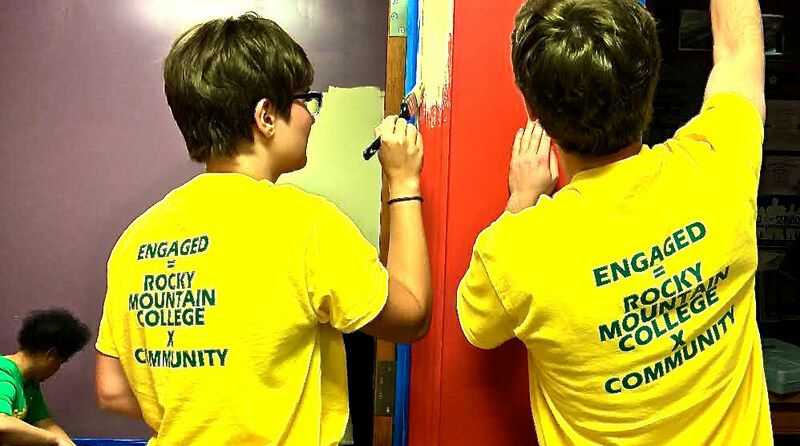 Rocky Mountain College is making moves to becoming a more civically engaged campus with over 2,000 volunteer hours logged by students since the beginning of the school year. Those hours were obtained through individual volunteering, student service leaders, and the annual Freshmen Service Day, which included 14 service projects around Billings. Community Service Coordinator Jill Washburn acknowledges that with Freshman Service Day, some students may feel like they are being “voluntold” because it is part of the first year experience at RMC. However, many students then find it to be fun and rewarding. “For me, I think it’s so great because it shows how much we’re giving back with both the Rocky and Billings communities,” Washburn said. There is worry from Washburn that students may not know about volunteer opportunities that exist beyond the initial service day. This is a concern because community engagement is considered part of the academic experience at RMC, with the idea being that learning extends far beyond the confines of a classroom. “It’s good for your resume, sure, but [volunteering] gives you a chance to learn and engage beyond academics. It gives you that life experience that helps you figure out what you want to do with yourself,” Washburn explained. Washburn believes that people can learn a lot about themselves from volunteering and that people should question why they do what they do based on their values. Washburn invites all students and faculty to be part of those solutions. The Office of Community Involvement is located in the Bair Family Student Center, downstairs in the Rocktivities Lounge. More information on community engagement or specific projects can be found on the bulletin board across from the outdoor recreation kiosk, the Rocky Mountain College Community Service Program Facebook page, or by emailing communityservice@rocky.edu.